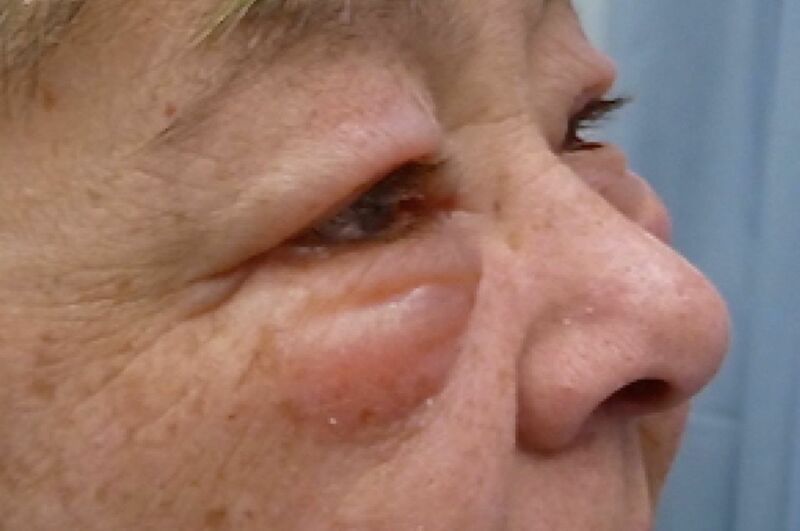 A 54-year-old woman presented to our dermatology clinic with a 2 months history of periorbital oedema, more prominent after lying down in horizontal position. Her face and throat felt swollen. She experienced dyspnoea on exertion, fatigue and had lost 6 kg of weight. Treatment with antihistamines and oral prednisone were ineffective. She smoked one pack of tobacco per week. Medical history and family history were unremarkable. She did not use any medications. Physical examination revealed prominent periorbital oedema and facial swelling (figure 1). Chest radiograph revealed a pathologically enlarged right hilum, broadened mediastinum and modest pleural effusion (figure 2). Diagnosis of superior vena cava syndrome (SVCS) was made and the patient was referred to the pulmonologist. Prominent periorbital oedema and facial swelling after lying down the night before as a presenting symptom of superior vena cava syndrome. 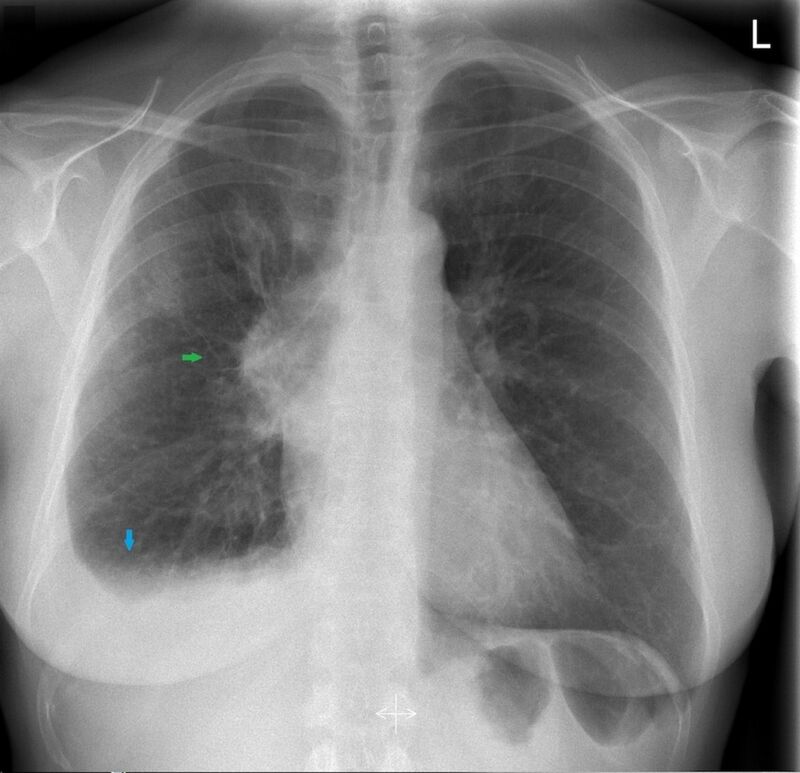 Chest radiography showing a broadened mediastinum with shading of the right hilus (green arrow) and pleural effusion (blue arrow). Five days later, she presented at the emergency department with haemoptysis and dyspnoea. Physical examination revealed additional distended superficial veins of anterior chest wall and decreased breath sounds over right lung area. CT scan demonstrated a large process in the right hilum with extensive mediastinal lymphadenopathy, almost completely compressing the superior vena cava, with partial atelectasis of right lower lung lobe and extensive pleural effusion (figure 3). Histological biopsy obtained by bronchoscopy revealed small cell lung cancer (SCLC). Positron emission tomography scan was suspect for left adrenal gland metastasis. SVCS was caused by stage IV SCLC, extensive disease. The patient passed away after several lines of therapy (chemotherapy, radiotherapy and study medication) due to progressive adrenal metastasis and symptomatic brain metastasis. 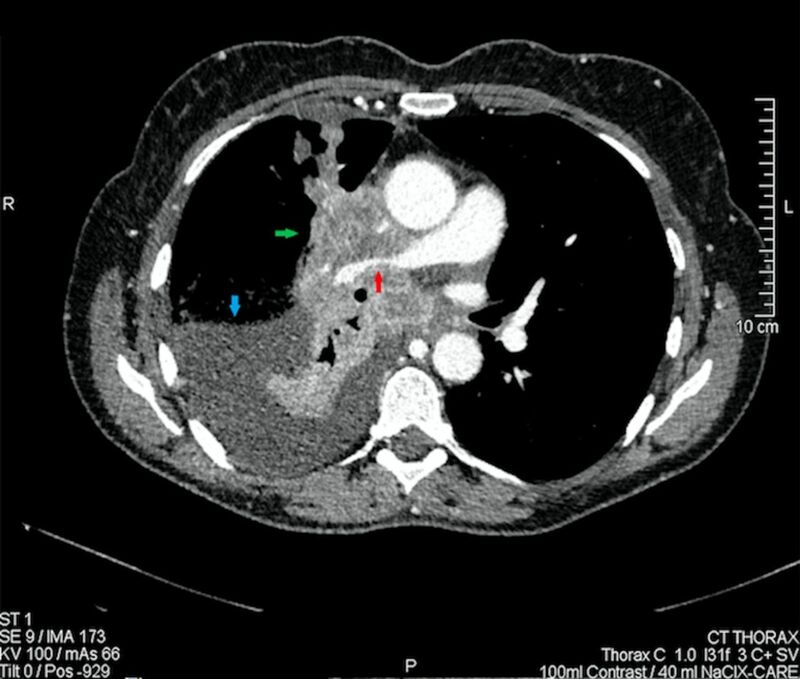 Chest CT demonstrating demonstrated a large infiltrative tumour in the right lower lung lobe (green arrow), almost completely compressing the superior vena cava (red arrow), with extensive lymphadenopathy and pleural effusion (blue arrow). Superior vena cava syndrome (SVCS) should be considered in patients with periorbital or facial oedema, especially when aggravated in horizontal position. Early diagnosis of SVCS is crucial in order to alleviate symptoms of obstruction and initiate immediate treatment to prevent life-threatening complications.
. Malignancy-related superior vena cava syndrome-UpToDate. http://www.uptodate.com/contents/malignancy-related-superior-vena-cava-syndrome (accessed 15 Feb 2018).
. Pemberton’s maneuver - a clinical test for latent superior vena cava syndrome caused by a substernal mass. Eur J Med Res 1997;2:488–90. Contributors ALN and LW discussed the reporting and design of the manuscript. ALN and LW drafted the manuscript. ALN, HB, JvH and LW critically revised the manuscript for improved intellectual content. ALN, HB, JvH and LW read and gave final approval for the submitted manuscript. ALN, HB, JvH and LW cared for the patient. Author note Informed consent was obtained from the patient (oral approval) and the husband of the patient (signed approval).